There’s momentum in them-there consumer “value” stocks! The question is which direction it will take in the near future. Consider spice maker McCormick (MKC). 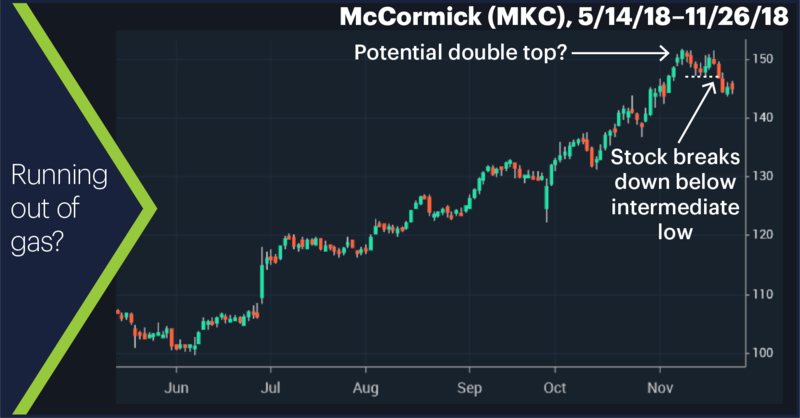 From a long-term investment perspective, it’s hard to quibble with MKC—the stock is up more than 300% over the past decade, with a mostly steady-as-she-goes ascent. That’s what most people would love to see in a consumer staples name—no drama, stable returns. And McCormick has continued to thrive in an increasingly tight food space (lots of competition and high costs) by virtue of its popular brands.1 Can you, for example, picture a supermarket spice aisle without the A-Z McCormick spice display? The fact that the stock tested that high a couple of weeks later and pulled back again likely has some traders thinking about a possible “double top” pattern, which would imply a downside reversal. In a nutshell, the logic is that an up-trending stock that stalls out at the level of a previous high (instead of pushing above it, as MKC has done to successive highs for the past several months) is showing signs of running out of gas. The typical “confirmation” signal of a double top is the downside penetration of the swing low separating the two highs—something MKC did last Thursday. So, more selling to come? Also, as yesterday showed, defensive buying can be fickle: MKC and other consumer staples names declined as the broad market rallied. If and when the market regains its footing (or actually stages a rally), consumer staples names could suffer from rotation into traditionally higher-momentum sectors. 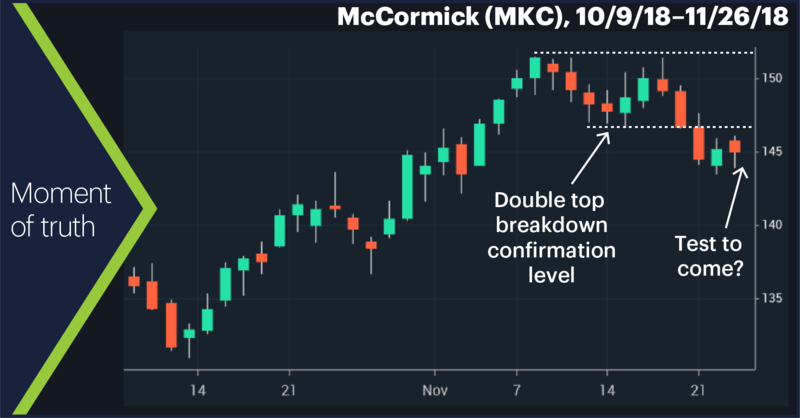 The shorter-term chart below shows that although it declined yesterday, MKC may be poised to test the double-top breakdown/confirmation level around $146.80. In short, for the double-top pattern to hold water, traders will be looking for the stock to turn lower at this level, or not too far above it. If it doesn’t—and especially if it takes out the double-top highs—the upside momentum game could be back on. When markets don’t do what they’re “supposed” to do, traders get caught leaning the wrong way, which can sometimes lead to big moves. Market Mover Update: The battered crude oil market got a respite yesterday, with January WTI crude (CLF9) jumping more than 2% to above $51.50/barrel. But the Bitcoin crash continued yesterday, with December Bitcoin futures (BTCZ8) dropping another 14% intraday to $3,505—a 49% drop over the past eight trading days, and more than 83% lower than levels from December 2017. And speaking of Bitcoin, after rallying 23% on Friday on news it was getting out of the online retail business and becoming a 100% blockchain technology company, Overstock.com (OSTK) lost more than 16% yesterday. Today’s numbers (all times ET): S&P Corelogic Case-Shiller HPI (9 a.m.), FHFA House Price Index (9 a.m.), Consumer Confidence (10 a.m.). Today’s earnings: Salesforce (CRM), Cracker Barrel (CBRL), Momo (MOMO), Patterson Companies (PDCO), GW Pharma (GWPH). 1 Zacks.com. Here's Why McCormick (MKC) is Sizzling in the Culinary Space. 10/1/18. 2 Investor’s Business Daily. McCormick Beats Earnings Estimates, But Trims Sales Outlook. 9/27/18.